Neodymium is a chemical element with symbol Nd and atomic number 60. It is a soft silvery metal that tarnishes in air. Neodymium was discovered in 1885 by the Austrian chemist Carl Auer von Welsbach. It is present in significant quantities in the ore minerals monazite and bastnäsite. Neodymium is not found naturally in metallic form or unmixed with other lanthanides, and it is usually refined for general use. Although neodymium is classed as a rare earth, it is a fairly common element, no rarer than cobalt, nickel, and copper, and is widely distributed in the Earth's crust. Most of the world's commercial neodymium is mined in China. Neodymium is also used with various other substrate crystals, such as yttrium aluminum garnet in the Nd:YAG laser. This laser usually emits infrared at a wavelength of about 1064 nanometers. The Nd:YAG laser is one of the most commonly used solid-state lasers. Neodymium, a rare earth metal, was present in the classical mischmetal at a concentration of about 18%. Metallic neodymium has a bright, silvery metallic luster, but as one of the more reactive lanthanide rare-earth metals, it quickly oxidizes in ordinary air. The oxide layer forms then peels off, exposing the metal to further oxidation. Thus, a centimeter-sized sample of neodymium completely oxidizes within a year. Naturally occurring neodymium is a mixture of five stable isotopes, 142Nd, 143Nd, 145Nd, 146Nd and 148Nd, with 142Nd being the most abundant (27.2% of the natural abundance), and two radioisotopes, 144Nd and 150Nd. In all, 31 radioisotopes of neodymium have been detected as of 2010, with the most stable radioisotopes being the naturally occurring ones: 144Nd (alpha decay with a half-life (t1/2) of 2.29×1015 years) and 150Nd (double beta decay, t1/2 = 7×1018 years, approximately). All of the remaining radioactive isotopes have half-lives that are shorter than eleven days, and the majority of these have half-lives that are shorter than 70 seconds. Neodymium also has 13 known meta states, with the most stable one being 139mNd (t1/2 = 5.5 hours), 135mNd (t1/2 = 5.5 minutes) and 133m1Nd (t1/2 ~70 seconds). Double nitrate crystallization was the means of commercial neodymium purification until the 1950s. Lindsay Chemical Division was the first to commercialize large-scale ion-exchange purification of neodymium. Starting in the 1950s, high purity (above 99%) neodymium was primarily obtained through an ion exchange process from monazite, a mineral rich in rare earth elements. 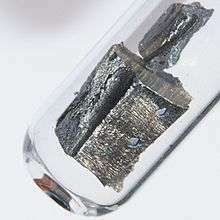 The metal itself is obtained through electrolysis of its halide salts. Currently, most neodymium is extracted from bastnäsite, (Ce,La,Nd,Pr)CO3F, and purified by solvent extraction. 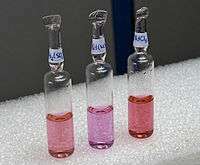 Ion-exchange purification is reserved for preparing the highest purities (typically >99.99%). The evolving technology, and improved purity of commercially available neodymium oxide, was reflected in the appearance of neodymium glass that resides in collections today. 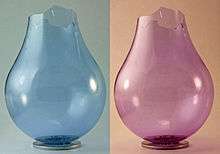 Early neodymium glasses made in the 1930s have a more reddish or orange tinge than modern versions which are more cleanly purple, due to the difficulties in removing the last traces of praseodymium in the era when manufacturing relied upon fractional crystallization technology. Neodymium is never found in nature as a free element, but rather it occurs in ores such as monazite and bastnäsite that contain small amounts of all the rare earth metals. The main mining areas are in China, the United States, Brazil, India, Sri Lanka, and Australia. The reserves of neodymium are estimated at about eight million tonnes. Although it belongs to the rare earth metals, neodymium is not rare at all. Its abundance in the Earth's crust is about 38 mg/kg, which is the second highest among rare-earth elements, following cerium. The world's production of neodymium was about 7,000 tonnes in 2004. The bulk of current production is from China, whose government has recently imposed strategic materials controls on the element, raising some concerns in consuming countries and causing skyrocketing prices of neodymium and other rare-earth metals. As of late 2011, 99% pure neodymium was traded in world markets for US$300 to US$350 per kilogram, down from the mid-2011 peak of US$500/kg. The price of neodymium oxide fell from $200/kg in 2011 to $40 in 2015, largely due to illegal production in China which circumvented government restrictions. The uncertainty of pricing and availability have caused particularly Japanese companies to develop permanent magnets and associated electric motors with fewer or no rare earth elements. Neodymium is typically 10–18% of the rare earth content of commercial deposits of the light rare earth element minerals bastnäsite and monazite. With neodymium compounds being the most strongly colored for the trivalent lanthanides, that percentage of neodymium can occasionally dominate the coloration of rare earth minerals—when competing chromophores are absent. It usually gives a pink coloration. Outstanding examples of this include monazite crystals from the tin deposits in Llallagua, Bolivia; ancylite from Mont Saint-Hilaire, Quebec, Canada; or lanthanite from the Saucon Valley, Pennsylvania, United States. 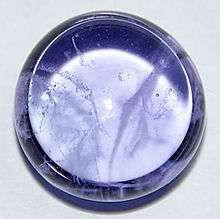 As with neodymium glasses, such minerals change their colors under the differing lighting conditions. The absorption bands of neodymium interact with the visible emission spectrum of mercury vapor, with the unfiltered shortwave UV light causing neodymium-containing minerals to reflect a distinctive green color. This can be observed with monazite-containing sands or bastnäsite-containing ore. Probably because of similarities to Ca2+, Nd3+ has been reported to promote plant growth. Rare earth element compounds are frequently used in China as fertilizer. Samarium-neodymium dating is useful for determining the age relationships of rocks and meteorites. Neodymium magnets (actually an alloy, Nd2Fe14B) are the strongest permanent magnets known. A neodymium magnet of a few grams can lift a thousand times its own weight. These magnets are cheaper, lighter, and stronger than samarium–cobalt magnets. However, they are not superior in every aspect, as neodymium-based magnets lose their magnetism at lower temperatures and tend to rust, while samarium-cobalt magnets do not. Light transmitted through neodymium glasses shows unusually sharp absorption bands; the glass is used in astronomical work to produce sharp bands by which spectral lines may be calibrated. Neodymium is also used to remove the green color caused by iron contaminants from glass. Neodymium is a component of "didymium" (referring to mixture of salts of neodymium and praseodymium) used for coloring glass to make welder's and glass-blower's goggles; the sharp absorption bands obliterate the strong sodium emission at 589 nm. The similar absorption of the yellow mercury emission line at 578 nm is the principal cause of the blue color observed for neodymium glass under traditional white-fluorescent lighting. Neodymium has been patented for use in automobile rear-view mirrors, to reduce the glare at night. Neodymium metal dust is combustible and therefore an explosion hazard. Neodymium compounds, as with all rare earth metals, are of low to moderate toxicity; however, its toxicity has not been thoroughly investigated. Neodymium dust and salts are very irritating to the eyes and mucous membranes, and moderately irritating to skin. Breathing the dust can cause lung embolisms, and accumulated exposure damages the liver. Neodymium also acts as an anticoagulant, especially when given intravenously. ↑ Toshiba Develops Dysprosium-free Samarium-Cobalt Magnet to Replace Heat-resistant Neodymium Magnet in Essential Applications. Toshiba (2012-08-16). Retrieved on 2012-09-24. 1 2 As hybrid cars gobble rare metals, shortage looms, Reuters, August 31, 2009. ↑ C. R. Hammond (2000). The Elements, in Handbook of Chemistry and Physics (81st ed.). CRC press. ISBN 0-8493-0481-4. ↑ "Chemical reactions of Neodymium". Webelements. Retrieved 2012-08-16. ↑ v. Welsbach, Carl Auer (1885). "Die Zerlegung des Didyms in seine Elemente". Monatshefte für Chemie und verwandte Teile anderer Wissenschaften. 6 (1): 477–491. 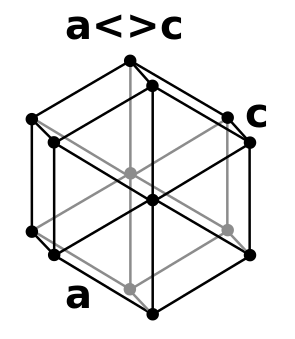 doi:10.1007/BF01554643. ISSN 0343-7329. ↑ Krishnamurthy, N.; Gupta, C. K. (2004). Extractive Metallurgy of Rare Earths. CRC Press. p. 6. ISBN 978-0-203-41302-9. 1 2 3 John Emsley (2003). Nature's building blocks: an A–Z guide to the elements. Oxford University Press. pp. 268–270. ISBN 0-19-850340-7. ↑ Weeks, Mary Elvira (1932). "The discovery of the elements. XVI. The rare earth elements". Journal of Chemical Education. 9 (10): 1751. doi:10.1021/ed009p1751. ISSN 0021-9584. ↑ "Prices of Rare Earth Metals Declining Sharply". The New York Times. November 17, 2011. ↑ "Team finds Earth's 'oldest rocks'". London: BBC news. 2008-09-26. Retrieved 2009-06-06. ↑ Norman, M.J.; Andrew, J.E. ; Bett, T.H. ; Clifford, R.K.; et al. (2002). "Multipass Reconfiguration of the HELEN Nd:Glass Laser at the Atomic Weapons Establishment". Applied Optics. 41 (18): 3497–505. Bibcode:2002ApOpt..41.3497N. doi:10.1364/AO.41.003497. PMID 12078672. ↑ "Chameleon Glass Changes Color". Archived from the original on 2008-04-03. Retrieved 2009-06-06. ↑ Charles Bray (2001). Dictionary of glass: materials and techniques. University of Pennsylvania Press. p. 102. ISBN 0-8122-3619-X. ↑ "History of Light, subheading "Timeline", 2001". Retrieved 2010-08-23. ↑ Swain, Frank (March 6, 2009). "How to remove a finger with two super magnets". Seed Media Group LLC. Retrieved 2013-03-31. ↑ Abrams, Rachel (July 17, 2014). "After Two-Year Fight, Consumer Agency Orders Recall of Buckyballs". New York Times. Retrieved 2014-07-21.